When Amazon introduced the Echo in the UK, it was the first time in a very long time I had been eager to try out some new technology; I had been waiting for the Google Home, but Amazon got there first so ended up with my money. My own personal feeling is that consumer technology seems to have stagnated over the past 5 years, with only incremental instead of revolutionary advances, so nothing really piqued my interest until affordable home control came into being, something that was finally within my budget. Being able to combine it with the Philips Hue system was great; though trying to find answers to questions proved ... interesting. Then, back in June, I decided to try and build my first Alexa skill. Nothing major, just a feed from this blog as a daily flash briefing. It worked, but I decided not to publish it as I would hardly consider the content of this blog to be frequent or interesting enough to warrant it joining the likes of CNN, BBC, Sky, and the rest! So I decided to go a bit deeper and, in July, attended an Alexa skills workshop in Brighton, where all attendees were baited with an Echo Dot for free if we published a skill in July. Whilst the presenter was talking through the afternoon, I started thinking about something that would be quick and easy to implement and ended up working on a super hero name generator. Straightforward and pointless, it should be enough to get a feel for the basics. I had misunderstood one of the submission criteria so the example utterances didn't follow the right format. 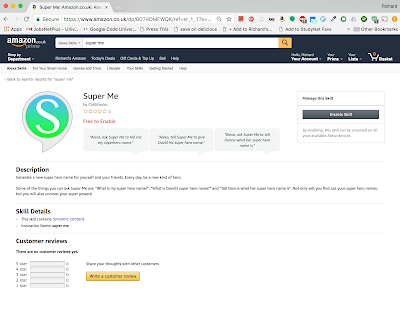 Two days ago I had the chance to fix the issues and re-submit and I was surprised and excited this morning to get an email saying that the skill is now live and available on the Alexa Skills Store!! Essentially, this skill takes the approach of trying to give you either a boost and/or a chuckle every day by giving you a new super hero name and super power. It boils down to just being a random name generator, but tries to keep consistent so that for any particular day, you will only be one particular super hero. The trouble with random name generators is that they are a one-hit fun-bit; 5 minutes having a play around then never coming back to it. The idea with the approach I have taken here is to constrain the fun, so people have to wait for their next name and, hopefully, weave that into their daily routine. In reality, this is unlikely to happen as the skill is, essentially, pointless fun. Which is fine, because I am running the backend on AWS Lambda, so every time someone requests a name, it gets added to my bill ... perhaps not the best considered option while I am job hunting. Anyway, please feel free to try it out and give any constructive feedback, either in the app reviews or in the comments below. It was meant to be a simple educational project, but if you can see ways of improving it and directions it could go in, I am open to ideas.